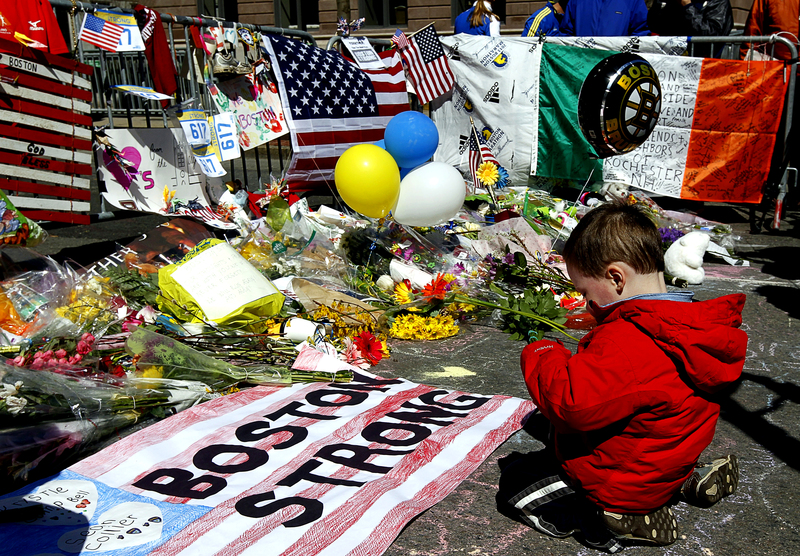 Two-year-old Wesley Brillant of Natick, Mass., kneels in front of a memorial to the victims of the Boston Marathon bombings in April 2013. Photo: REUTERS/Jim Bourg. Courtesy HBO. Photo: ©Tom Green/ ZUMAPRESS.com. Courtesy HBO. Lincoln’s perceptive assessment of the American spirit is as timely today as it was in 1861. For more concrete evidence that we, as Americans, all have the potential to be driven by “the better angels of our nature,” I urge you not to miss Marathon: The Patriots Day Bombing. After winning accolades on the film festival circuit, this powerful, feature-length documentary makes its cable debut on HBO, Monday, November 21, 2016, 8:00 – 10:00 p.m. ET/PT. (Check listings for additional HBO playdates in the weeks ahead and availability on HBO NOW, HBO GO and HBO On Demand and affiliate portals.) HBO will also mark the fourth anniversary of the Boston Marathon bombing in an encore presentation on Saturday, April 15, 2017, and with DVD availability on Patriots Day, Monday, April 17, 2017. Marathon: The Patriots Day Bombing recounts in gripping, edge-of-your-seat fashion the horrific events that unfolded during the 117th running of the Boston Marathon on Founders Day, April 15, 2013. Primary focus is placed on several severely injured survivors–a mother and daughter, two brothers, and a newlywed couple–who began that day as healthy, eager bystanders and ended it on the blood-soaked sidewalk, their bodies shattered by shrapnel from homemade terrorists’ bombs. That these passionate Americans lived to tell their stories is miraculous in itself, but how they managed to survive and rebuild their lives will touch your heart and inspire grateful reflection as you celebrate Thanksgiving later this week with family and friends. Love truly conquers all. The extraordinary resilience of newlyweds Patrick Downes and Jessica Kensky is chronicled in MARATHON: THE PATRIOTS DAY BOMBING. Photo: Allana Taranto. Courtesy HBO. Filmmakers Ricki Stern and Annie Sundberg frame the personal stories of these resilient survivors and their families with a stirring tapestry of news and found footage, home movies, photos and audio that documents the carnage and the “better angels” who played a pivotal healing role that day and in the days and years that followed. We see firsthand what it’s like to grieve for lost limbs and healthy lives; and we witness the fortitude it takes to survive the collateral damage from shrapnel wounds–constant pain, disfigurement, repeated unsuccessful surgeries and unrelenting post traumatic stress. We revisit the manhunt impressively orchestrated by the FBI and local authorities that led to the suspects’ dramatic apprehension. And we experience the conflicted emotional toll exacted on the victims and the journalists forced to cover the surviving terrorist’s trial. The film is dedicated to the four deceased victims–Martin Richard, Krystle Campbell, Lu Lingzi and Sean Collier–of this homegrown terrorist attack. Their families, along with the survivors and their families, once strangers, are now bound together forever by their shared life and death struggles, as well as with the journalists and photographers who documented their progress in The Boston Globe, and the selfless civilians and military and medical personnel whose life-saving heroics on that fateful day in April 2013 are simply without peer. 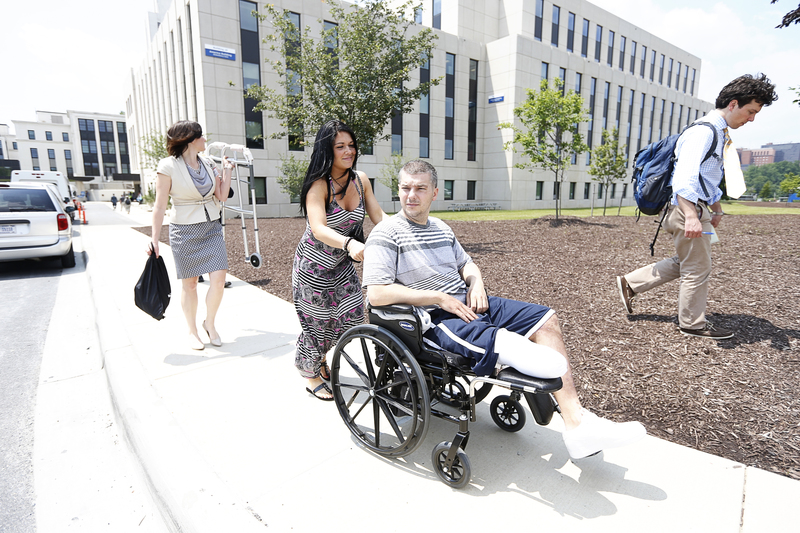 JP Norden, a Boston Marathon bombing survivor, visits his doctors and amputees who served in the U.S. military at Walter Reed National Military Medical Center. He and his brother, Paul, were badly injured, but both survived. Photo: Yoon S. Byun/The Boston Globe. Photo courtesy HBO. Marathon: The Patriots Day Bombing will not only move you to tears but will restore your pride in America and the heroes who continue to live among us. The film explores what it truly means to embrace life, grieve loss, to heal and most especially, what it means to be courageous and to love someone unconditionally, whether it be a spouse or partner, mother, son, daughter, brother, caregiver, or even a pet. Writer/directors Ricki Stern and Annie Sundberg, in association with The Boston Globe, remind us that America is and always has been “great,” simply because heroic, resilient Americans to the left and right of us are still out there insuring the democratic fabric of our nation and making a positive difference in the lives of others. The subjects of this extraordinary film are all heroes in my book. 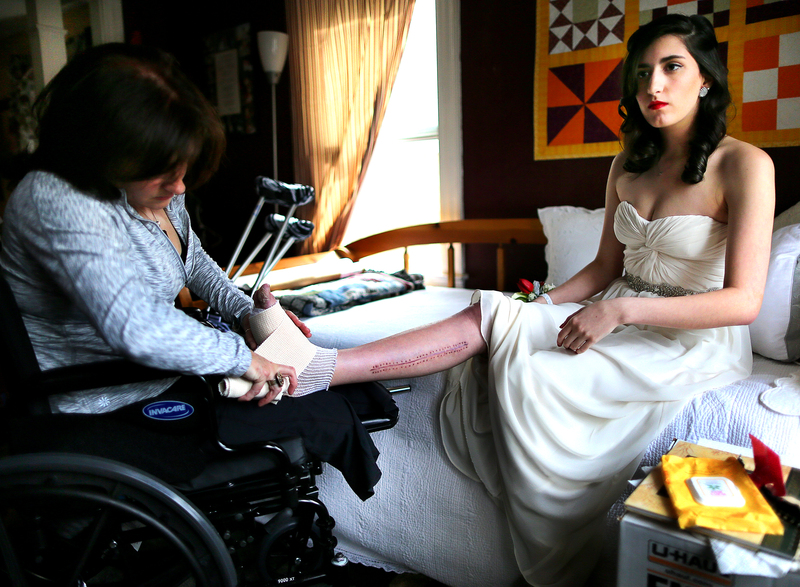 18-year-old Sydney Corcoran, a victim of the Boston Marathon bombing, preps for her Lowell (Mass.) Senior Prom. Her mom, Celeste, who lost both her legs in the bombing, changes the bandages on her daughter’s injured foot. Photo: John Tlumacki/The Boston Globe. Courtesy HBO. Marathon: The Patriots Day Bombing makes its cable debut on HBO, Monday, November 21, 2016, 8:00 – 10:00 p.m. ET/PT. (Check listings for additional HBO playdates in the weeks ahead and availability on HBO NOW, HBO GO and HBO On Demand and affiliate portals.) HBO will also mark the fourth anniversary of the Boston Marathon bombing in an encore presentation on Saturday, April 15, 2017, and with DVD availability on Patriots Day, Monday, April 17, 2017. 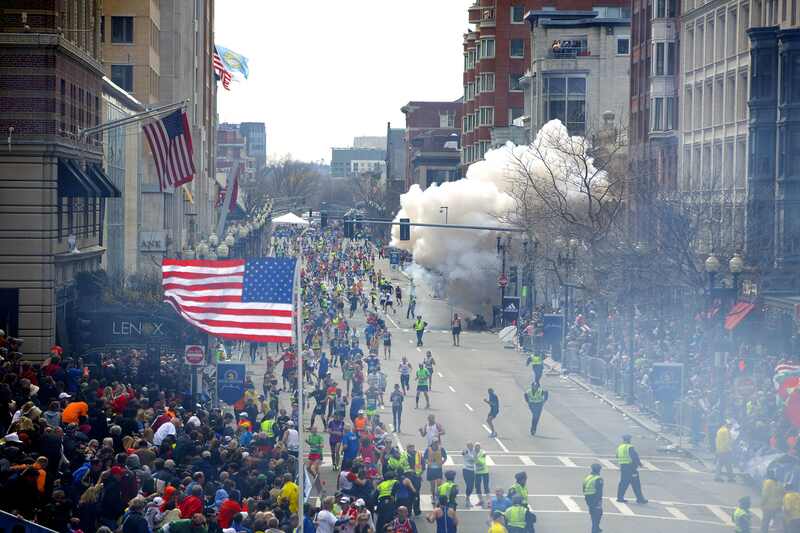 This entry was posted in Cable, Film, Journalism, Newspapers, TV and tagged Abraham Lincoln, Annie Sundberg, Boston Marathon Bombing, Corcoran Family, Crime & Punishment, Downes/Kensky Family, Family Relationships, Grief, HBO, Marathon: The Patriots Day Bombing, Norden Family, Paul Brill, Ricki Stern, Terrorism. Bookmark the permalink. As a veteran and a marathon runner I appreciated your review and recommendation. As far as the term “hero” goes, I would feel more comfortable that it once again refer to recognized enactments of extraordinary valor and not suffer the dilution of being made synonymous with participation.